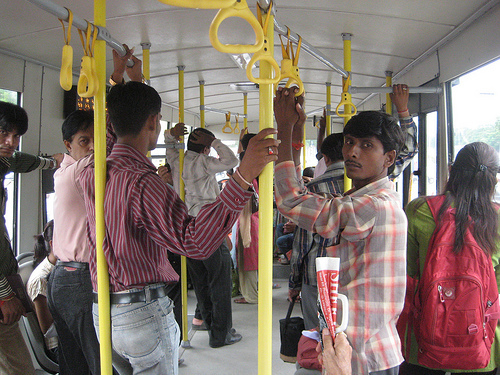 Janmarg is the first full BRT system in India. Photo by Madhav Pai. The international public transport community defines bus rapid transit (BRT) as “a flexible, rubber-tired form of rapid transit that combines stations, vehicles, services, running ways and [intelligent transportation systems] elements into an integrated system with strong identity” (TCRP Report 90, “Bus Rapid Transit – Volume 2: Implementation Guidelines,” 2003). The new Janmarg BRT system, in the process of being completed in Ahmedabad, Gujarat, meets most of the highest standards applied internationally. It is already a “best practice” of BRT in South Asia, in sharp contrast to the bus corridors in operation in Delhi and Pune, which are off to a good start but still have much room for improvement. The system also includes electronic fare collection, centralized control and user information systems. All these elements are classified as high-end, making Janmarg the first full BRT system in India. In August 2009, the system was still in a pre-operational state, with free services provided during part of the day. At that time, usage was already very high. Some elements to improve include completing several details in the road and especially at the stations. Also, it was observed that the bike tracks along the corridor were not used by most bicyclists, probably due to the presence of debris. Also, pedestrian crossings at the far side of the stations did not have adequate signals, and the signaling system was not integrated, yet. Special attention to permanent maintenance was evident. For instance, several bollards to control motor vehicles in pedestrian crossings were damaged. Also, fare collection, central control and dispatch, and variable message signs at stations, were not yet operational. However, most of the missing elements were in the process of being completed. When fully realized, the system is expected to achieve high user acceptance, reduce total travel time for system users, and provide reliable and comfortable services, with very low costs compared to rail alternatives with similar performance. It also brings the opportunity to reduce harmful local and global emissions, increase the safety and security of the corridor, and improve opportunities for orderly urban development. To realize all these benefits, the implementation needs to be carried out as planned. It is also necessary to set up a quality improvement program, which measures system performance and provides input to continuous improvement. Given the careful planning and implementation, it is expected that the system will be a great success, and a great example for other applications in India and beyond. Creating a successful BRT system is the result of strong leadership, in this case, demonstrated by Mr. Gautam of the Ahmedabad Municipal Corporation. It also involves adequate coordination among stakeholders, and good technical planning and careful implementation, achieved with the support from the Centre for Environmental Planning and Technology (CEPT) and the Institute for Transportation and Development Policy (ITDP). The systems approach, which combines infrastructure, vehicles, operations, technologies and user education, creates a seamless implementation process. Quality assurance through performance monitoring will bring permanent service improvements and is the next step after completing the infrastructure details. View more documents from EMBARQ Network. Ahmedabad BRT Janmarg from EMBARQ Network on Vimeo. Also, find photos by Madhav Pai on EMBARQ’s Flickr photostream.